Remember, remember the 5th of November……. 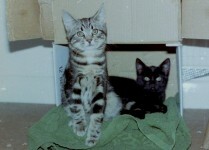 Benson and Chester, pictured below at two years of age, started their lives at the bottom of a bonfire heap. Our volunteers in the Central London branch of Cat Action Trust 1977 discovered them in the smouldering ashes of a half burnt bonfire, miraculously unharmed, apart from singed whiskers and eyebrows and badly irritated weepy eyes. The story of their dramatic rescue was featured in the magazine Cat World where it was spotted by a journalist from the Daily Telegraph who used it in an article warning everyone (at any time of the year) to check carefully for cats, kittens and hedgehogs before lighting bonfires. 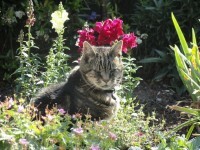 Of course, at this time of the year, we cannot stress enough the importance of keeping your cats safely indoors on Guy Fawkes Night – but also in the days around bonfire night as nowadays people often have their fireworks parties before or after November 5th. Benson and Chester both lived to a good age. 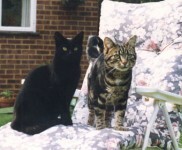 When Benson died, his owners approached CAT 77 Central London Branch and re-homed two more kittens – Sydney and Douglas. 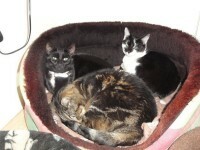 As you can see from the photo, they all get along very well indeed!